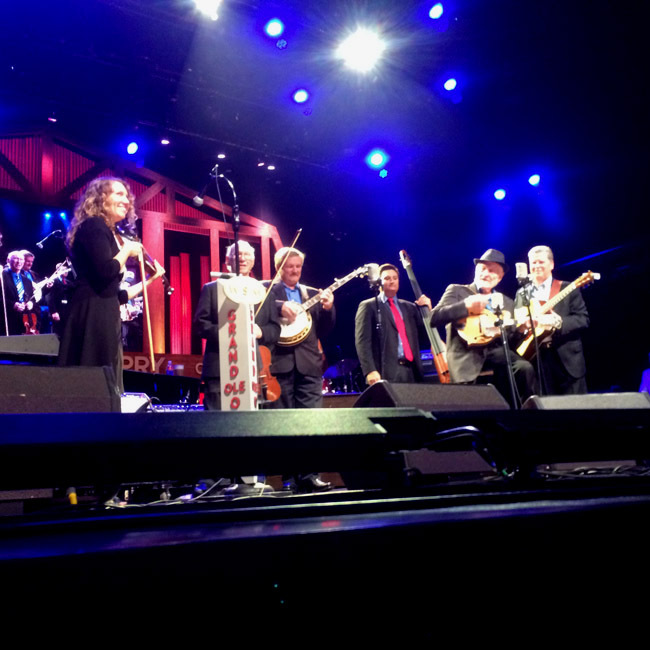 Playing the Opry is quite possibly one of the most sought-after goals for any musician who grew up steeped in bluegrass. All of our heros played it. And there’s just something legendary about a show that has never missed a broadcast since its beginnings in 1925. Combine that aspect with the performance itself being with someone who has been one of your heros since you were 3 years old — there are simply no words for this type of thing!!!!!!! As I drove up to the backstage of the Grand Ole Opry house on Saturday, February 20, 2016, about 7 pm CST, I heard the Opry broadcast commence on the radio. I’ve listened many times, but this time it was different. I realized I was going to be on there, and with Jesse McReynolds. 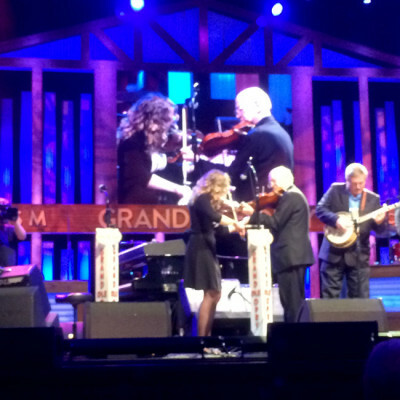 Several friends — all men — had inquired point-blank after I’d been asked to play the Opry, “Did you cry?” I hadn’t up to that point, but big tears started welling up when I heard that announcement and fiddle intro — the show had begun! The evening itself was nothing short of magical. As I walked up to the entrance, Buddy Griffin opened the door and greeted me by saying, “Welcome to the Grand Ole Opry!” When I checked in, I discovered I’d been sent beautiful flowers — from Jesse, Joy, and all the Virginia Boys! Jesse was so gracious and awesome; he is not only a living legend but a true gentleman to work with. 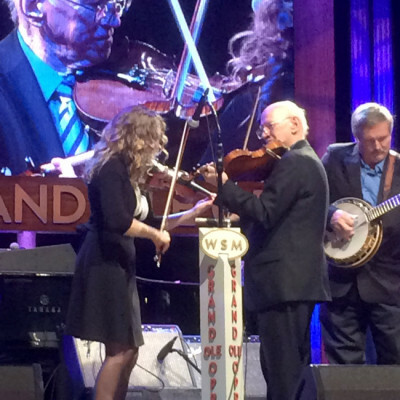 For the performance, Buddy Griffin and I played twin fiddles (I played lead and Buddy played harmony)” on Jesse’s original fiddle tune, “Dixie Hoedown,” a bluegrass classic that comes to us from the Starday era of Jim & Jesse (highly recommended listening). The original cut of “Dixie Hoedown” was recorded with Vassar Clements and Jesse McReynolds on twin fiddles. When Buddy and I played it, it felt like I was almost in the record! 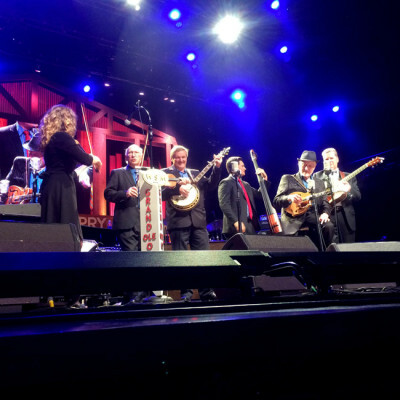 When it finally came time to perform onstage, Jesse offered a very special introduction and announced “Dixie Hoedown,” and we took off! It was exhilarating! There are really no words to sum up such an event. It’s pretty much the stuff that dreams are made of, a blessing of enormous proportions. I thank the Lord for such an opportunity, a real dream-come-true!